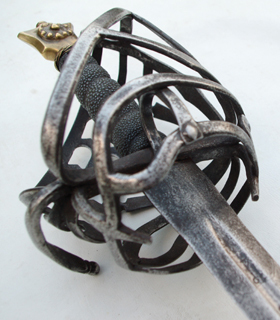 The schiavona has always been one of my favorite sword styles. 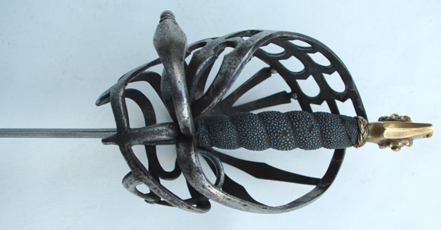 Its a very distinctive type, and in my opinion the most beautiful styles of basket hilts out there. I have recently taken a big step with my collection, and I have purchased a wonderful antique schiavona. This piece is in very good condition, showing some surface corrosion, and with a very slight wiggle on the guard. Other than that, the rest of the hilt components are rock solid, and the patina isn't bad at all. I unfortunately can't seem to find my scale that I normally use for weighing swords, so I had to use a fairly innaccurate bathroom scale, which says the sword is roughly 2 1/2 lbs. 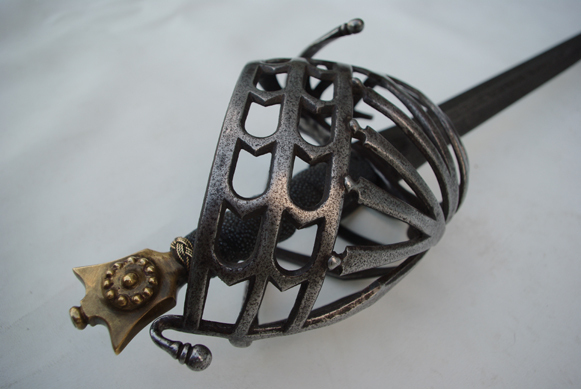 It feels lighter: The sword has a wonderful balance for both cutting and thrusting, and it is made even livelier by the thumb ring inside the guard, which really aids in the way I am able to make cutting actions. The tip control is excellent, and I've been doing light solo drills in the Bolognese tradition with it because it feels so "right" for the actions. The blade is quite thin and still sharp. In fact, it has the type of blade that many well-meaning modern enthusiasts would unfortunately call "whippy", which is not only historical (as is evidenced here), but quite common on thin cutting blades such as this. The grip is wrapped with rayskin with a spiral groove. There is evidence that there may have once been a wire that laid in that groove, but is now gone. Dating the sword is tricky. The blade has the engravings "S-O-L-I D-E-O" on one side and "G-L-O-R-I-A" on the other. This roughly means "For the Glory of God Alone", and this is one of the five sola of the Protestant Reformation (five Latin phrases that encapsulate the movement's beliefs). The Protestant Reformation is generally accepted to have ended at about 1648, so that most likely places the age of the blade in the first half of that century. 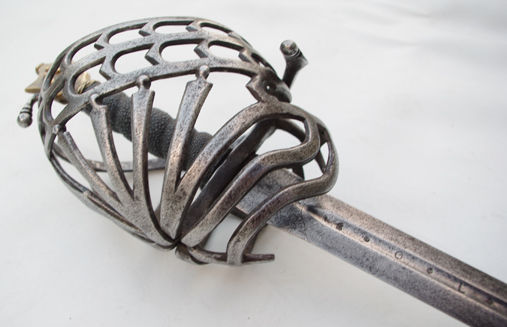 I do not know for certain if the guard is also from the 17th c, as it is not uncommon for these blades to be fitted to guards later in life. It is also not out of the realm of possibility that the sword is composite of multiple schiavona parts. I've been spending quite a lot of time trying to figure out what time period the guard is from, and I'm still not 100% certain. 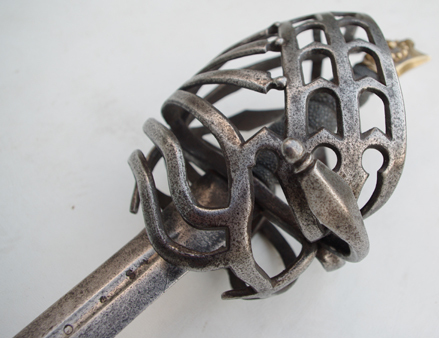 There are a number of guards that are more or less exactly like this dated anywhere from the middle of the 17th century into the middle of the 18th century, and Oakeshott himself laments the troubles of dating these hilts in European Weapons and Armour from the Renaissance to the Industrial Revolution. 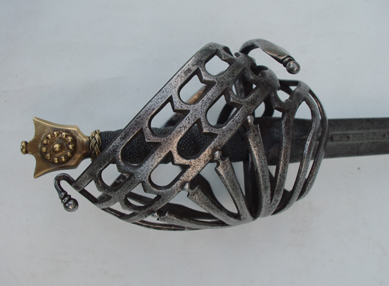 I'm suspecting it is a 17th century hilt based on its similarity to many other 17th century hilts, but can't be completely sure because there are some 18th century ones that aren't that different as well. If anyone else has any information regarding this, I would highly appreciate it! 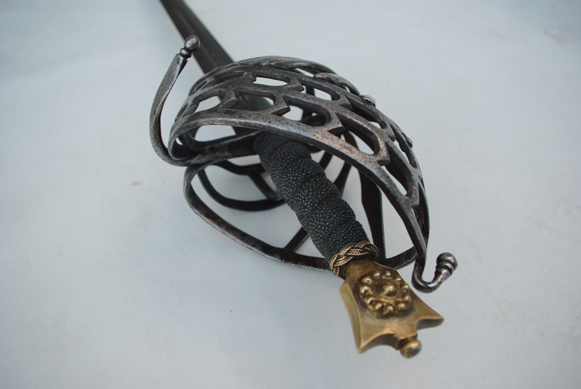 Needless to say, I'm quite enamoured with this sword. I had to sell a couple of my more highly prized modern reproductions to afford it, but I don't regret that for a second. To have such a wonderful piece of history in my possession is both exciting and an honor, and I intend to let students handle and examine it so that others can better appreciate this wonderful weapon. whoa Bill....that's a mighty fine piece you've acquired. Biggest of congrats, I bet you are chuffed with it! Since Nathan is the schiavona guru around these parts, I'd think he may have something. I've got alot of stuff on the 17th c. but most is mortuary, ECW material, though I do have some schiavona info. in a pile...somewhere plus some photos form some of the antique dealers from over the years....I'll go digging. Awe common, you get this and your not comming to Todd's next weekend to share? That's awesome! They're my favourite baskets too... It looks so well kept for something AT LEAST 200 years old! Congratulations, that is a beautiful piece. Stunning, actually. Even the fact that I just pulled my long-awaited Vigil out of it's box 2 hours ago does not prevent you from having my fullest envy. Much envy! 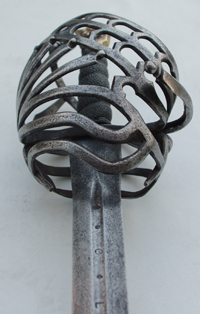 The schiavona is my favorite of the more modern swords. Is this your first antique? As promised, here are some more pictures. I wish. Summertime is the craziest time for me of the year. But I'll likely bring this to WMAW, if you'll be there. Its not my first antique, though its by far the most I've spent on an antique. 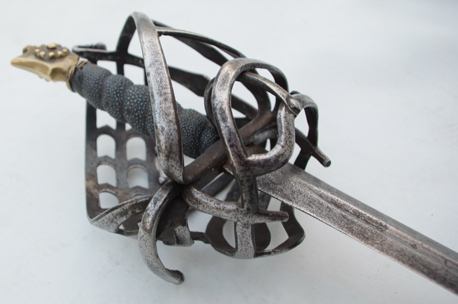 I own a smallsword from about 1720 and a mid-18th century smallsword blade mounted to modern hilt by Erik Stevenson (these are both in my collection gallery hosted on this site). I've owned several WWI and WWII knives that my father gave me, and I bought a 1920 Dutch Klewang when I was a teenager (got that one for only $50! ), but I sold the Klewang several years back. This, however, was a much bigger purchase than any of those, but I don't regret it at all. I too hope to join in the antique sword collection market some day, though it would probably be neigh impossible on a teacher's salary. How does the rayskin feel in-hand? I've never messed with the stuff before, at all. Do you plan to do any restoration work, or leave it as-is (particularly re-applying the wire wrap and fixing the slight wobble you spoke of)? Well, I teach fencing for a living, so I hear you. I make less than a typical teacher does. Its really just a matter of being smart with your money and saving with the goal of getting what you really want. How does the rayskin feel in-hand? I've never messed with the stuff before, at all. Its quite comfortable. It gives a very firm grip, but isn't as rough on the hands as wire wrap (though I will admit that my hands are fairly calloused, and I use wire wrap grips without gloves all the time, so your mileage may vary). Do you plan to do any restoration work, or leave it as-is (particularly re-applying the wire wrap and fixing the slight wobble you spoke of)? I think I'm going to leave it as-is. The wobble is barely noticeable (I have several modern repros that are much worse which I don't bother fixing), and the wire wrap would require altering the grip, which is something I don't want to do. I'm incredibly happy with the sword the way it is now, and I fear that if I messed with anything I'd cause more harm than good. Truly a gorgeous purchase! I can't wait to get a look at this close-up. One of these days I may look into getting a nice antique.. something older than 19th/20th Century, that is. Incredible weapon Bill congratulations. Do you think you will ever test-cut with it? I don't suppose you want to share how much it cost you, ball park? It may be a big step but it seems a logical one to me. If owned more than a couple high-end replicas I'd be tempted to trade up to a nice antique like that as well. Do you think you will ever test-cut with it? No, I don't think I ever will. Even though its pretty sturdy, I have no idea what the heat treatment is like. Its also a pretty thin blade. It was just pointed out to me that I forgot to include the point of balance. Whoops! I just edited the original post to include that. Congratulations on the Schiavona, a real beautiful piece! 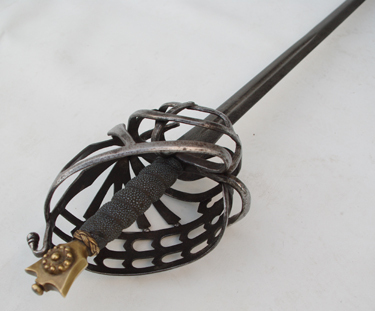 Have always been attracted to this type of sword, probably for no reason other than the graceful hilt. Very happy for you, man that is a great score! I wonder if I could get like Eljay to make me a basket like that and I could make a fancy blade for it. Bet he could, when I get the scratch. But, oh my gosh what a beauty.